U.S. stocks were in the red Monday as investors took a step back from last week's Fed-inspired rally. With little on the economic docket, coupled with the start of the Jewish New Year, Rosh Hashanah, analysts figured trading would be light. Tim Ghriskey, chief investment officer at Solaris Asset Management, said the lack of news and holiday definitely impacted volume and market movements. 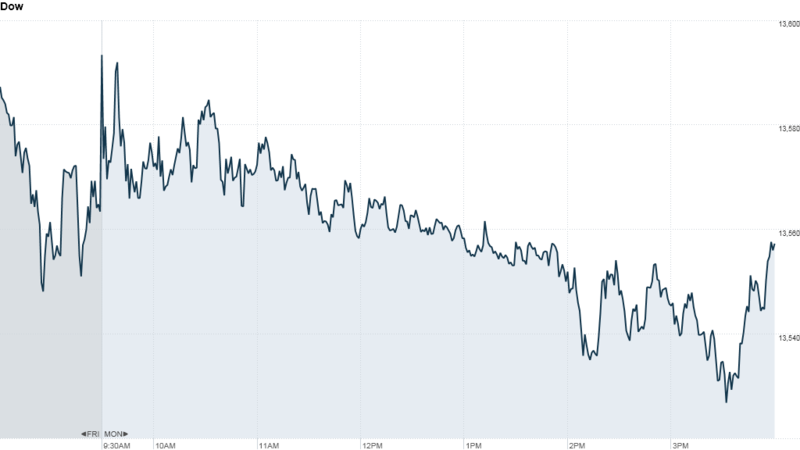 Stocks hit multi-year highs following the Federal Reserve's quantitative easing, or QE3, announcement last week. The central bank said it would buy $40 billion of mortgage-backed securities each month. But as the excitement wears off, investors will be keeping close tabs on upcoming economic data for any clues as to how long the central bank's easing will be needed. U.S. crude futures, which soared on the Fed's announcement last week, fell more than 2% Monday as the Fed-related boost appeared to fade, U.S. October crude oil futures slid to $96.62 a barrel. The only economic report of note on Monday, the September Empire State Manufacturing Survey, came in worse than expected and signaled further weakness in manufacturing in New York. "It's another sign that the Fed needed to act ... and acted with a greater impact than expected," Ghriskey said. "The unevenness of economic data and the lack of positive momentum was of concern to the Fed and we see that in today's manufacturing number." Investors will get a broader view on manufacturing later in the week, when the Philadelphia Fed releases its report. But housing data will dominate this week, with reports on mortgages, housing starts, building permits and existing home sales due out starting Tuesday. In Europe, investor optimism over the latest moves to solve the debt crisis has started to fizzle. European stocks ended the day in the red. The euro remained at five-month highs against the U.S. dollar, hitting a high of $1.317. In Asia, Chinese stocks tumbled overnight, ahead of news that the Obama administration planned to file a complaint over Chinese trade with the World Trade Organization. The U.S. government alleges that China violated WTO rules by subsidizing automotive exports to the tune of $1 billion. The Shanghai Composite dropped 2.1% while the Hang Seng in Hong Kong ticked up 0.1%. Japanese markets were closed for a holiday. 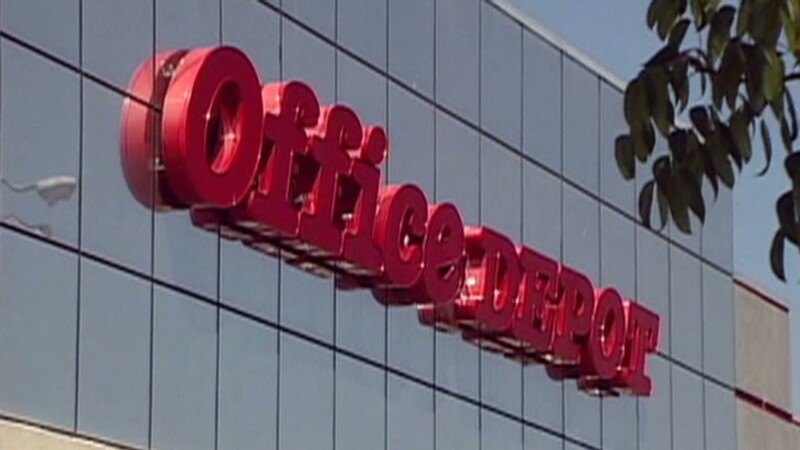 Companies: Office Depot (ODP)got a boost after activist investment firm Staboard Value disclosed a 13% stake, making it the firm's biggest shareholder. Starboard made a case for improving the "undervalued" business in a letter to Office Depot's CEO. Shares of LDK (LDK), a large Chinese solar products manufacturer, sank nearly 1% after the company reported a second-quarter loss of $92 million. Apple (AAPL) shares hit another all-time high Monday, coming within spitting distance of $700 in regular trading. Shares topped $700 after hours. Investors are excited as pre-orders for the iPhone 5 sold out and people started lining up outside retail stores to get their hands on the latest iPhone, which doesn't hit stores until Friday. Early Monday, AT&T (T) said the iPhone 5 was the fastest selling iPhone it has ever offered. Commodities: Gold futures for December delivery lost $2.1 to $1,77.60 an ounce. Bonds: The price on the benchmark 10-year U.S. Treasury rose slightly, pushing the yield down to 1.84% from 1.87% late Friday.